The sequel to the classic Disney animation Fantasia (1940) again included computer-generated sequences. This time, the animations were accompanied by 48-track digital sound and projected on a 56-foot-tall IMAX giant-screen screen. This was the first feature-length animated feature film released in the IMAX format (70 mm) for IMAX theaters. Shostakovich's Piano Concerto # 2: Hans Christian Andersen's "Steadfast Tin Soldier"
Director David Fincher's remarkable cult film was about an insomniac office-worker, an un-named Narrator (Edward Norton), who identified with an all-male support group, known as "Fight Club" - led by Tyler Durden (Brad Pitt) - the unreliable Narrator's own schizoid alter-ego that was being mentally projected as another individual. It was noted as having extensive and revolutionary use of photogrammetry, a CGI first-person image-based modeling technique. Wire-frame 3-D models were created from photographs or real, still objects. The photos were then reemployed as texture maps, augmented with additional paint work. This allowed for high-speed, photo-realistic camera movements around (or inside and through) objects - and other seemingly impossible feats. This kinetic, action-oriented, science-fiction virtual reality film came from the directorial writing team of the Wachowski brothers, and included incredible Oscar-winning Visual-Effects (defeating Star Wars: Episode I - The Phantom Menace (1999) and Stuart Little (1999)). It combined many innovative visual and special effects elements comprising about 20 percent of the entire film. This popular, imaginative, visually-stunning film made reference to prototypical elements of the 21st century high-tech culture, such as hacking and virtual reality, and included bullet-dodging. It told of a future where subdued and enslaved humans were literally plugged into and harvested as batteries (an energy source from their heat and bio-electrical activity). And reality was nothing more than a computer simulation (the "Matrix") created by the sentient machines. Digital effects dubbed "flow-mo" and "bullet time" - slowed-down, rotating action - were created with suspending actors on wires, using motion capture, and filming segments with multiple still cameras shooting from multiple angles, and then enhancing the pictures with CG interpolation. These tremendous visual effects were combined with Eastern world-denying philosophy, metaphysical Zen statements, martial arts movies, Japanese anime, Greek mythology, cyberpunk chic, neo-Cartesian plot twists, film noir, Biblical and Lewis Carroll (Alice in Wonderland) references. Director Stephen Sommers action film was a remake of Universal's horror classic The Mummy (1932). About a fifth of this action film's budget was spent on special effects. Industrial Light & Magic (ILM) used a combination of motion capture, key-frame animation, live-action, and computer graphics (digital prosthetic makeup) to create the menacing, 'undead' high priest character of Imhotep (Arnold Vosloo) as a mummy - progressively regenerated. It had the most realistic digital human character ever seen, with totally computer-generated layers of muscles, sinew and tissue. It also reprised the pioneering Ray Harryhausen stop-motion animated scene of fighting skeletons (in Jason and the Argonauts (1963)) now as fighting mummy-priests and guards, along with hordes of computer-generated flesh-eating scarabs, and swirling dust-storms. George Lucas' fourth film in the series, the first of a prequel trilogy, was the first Star Wars film to not win an Academy Award for Best Visual Effects - it lost to The Matrix (1999). It had a long-lasting influence on the future of films - and encouraged more blockbuster visual effects. But it was widely considered to be lacking in the quality of its story and characters. It undoubtedly contained more computer animation and special effects than any previous film - over 90%. Only 12 minutes of the 133 minute film had no special effects. There were approximately 2,000 digital visual effects in the film, and over 60 different digital characters. A few of the more spectacular F/X sequences were the CGI pod race, the battle between the Gungans and the Droids, and the final duel between Sith Lord Darth Maul (Ray Park), Qui-Gon Jinn (Liam Neeson) and Obi-Wan Kenobi (Ewan McGregor). It also featured a completely CGI-generated (all digital), fully-articulated main humanoid character named Jar Jar Binks (voice of Ahmed Best), a widely-derided aspect of the feature film. Jar Jar was a "Gungan," an alien indigenous to the planet Naboo. Other main CGI characters included Boss Nass (voice of Brian Blessed), the rotund Gungan leader, and Watto (voice of Andy Secombe) - the greedy human trafficker and owner of a junk dealership in Mos Espa on the planet of Tatooine. George Lucas decided to add CG - digital effects to hundreds of shots, mostly in his original Star Wars trilogy. Many changes were the result of vast improvements in CGI technology and other production techniques since the late 1970s. Other special effects were added because they were not available earlier. Note: The original trilogy films were changed once again for their release on DVD in 2004. A few changes that were made for the 1997 Special Editions were removed, and other additional changes were made. One major controversial change was a scene at the end of Episode VI: Return of the Jedi (1983), when the spirits of Obi-Wan Kenobi, Yoda and Anakin Skywalker looked upon the Rebels' celebration. The original actor who played Anakin in this scene (Sebastian Shaw) was replaced by Hayden Christensen, the actor who played Anakin in Episodes II and III. In Episode V: The Empire Strikes Back (1980), there was a scene of the appearance of Emperor Palpatine via hologram to Darth Vader. In the 2004 DVD redo, the older version of Emperor Palpatine (portrayed by Elaine Baker and with dialogue dubbed by actor Clive Revill) was updated (as portrayed by Ian McDiarmid). Later, one of the more striking changes in the Prequel Trilogy occurred in Star Wars, Episode II: Attack of the Clones (2002), and Star Wars, Episode III: Revenge of the Sith (2005), when a fully computer-generated Yoda replaced the original puppet (Frank Oz) from earlier episodes in the original trilogy. This comedy family film marked the live-action directorial debut of ex-Disney animator Rob Minkoff. The kids-oriented story was derived from the 1945 children's book by E.B. White, featured the CGI character of fuzzy, well-dressd, talking white mouse Stuart Little (voiced by Michael J. Fox), another example of seamless integration between live-action and CGI. It was the first instance of a 100% photorealistic CG star in a live-action film. It was very difficult to tell where the CGI effects ended (i.e., the cats, led by the white family cat Snowbell (voice of Nathan Lane)) and the live-action occurred. Reportedly, Stuart's head alone contained a half-million computer-generated hairs. It led to sequels in 2002 and 2006. Disney's computer-animated musical adventure film was the first large-scale animated motion picture of the Tarzan (King of the Jungle) legend. It appeared an incredible 81 years following the first film about the famous ape-man, director Scott Sidney's Tarzan of the Apes (1918). It was the most expensive animated film ever made at the time, budgeted at $130 million. And it was the first major all-digital feature release to have been produced, mastered, and projected digitally. It was Disney's most visually-advanced film at the time. It was based on the story Tarzan of the Apes by Edgar Rice Burroughs. The feature-length animation employed technologically-advanced animation effects (painting and rendering), with extensive use of a pioneering computer animation software system known as Deep Canvas. It made possible the creation of remarkable 3-dimensional backgrounds and the illusion of depth. By studying the movement of animals, and of the human musculature for the animation, Tarzan was the first Disney character to accurately display working muscles. Tarzan's motions as he swung through the jungle vines were modeled after the movements of skateboarders. Director Tarsem Singh's stylish and innovative sci-fi thriller (his first feature film) told about the empathic journey of a child psychotherapist Dr. Catherine Deane (Jennifer Lopez) into the minds of comatose individuals, including sadomasochistic, blond-haired, psychopathic serial killer Carl Rudolph Stargher (Vincent D'Onofrio). The film was also nominated for a Best Makeup Oscar Academy Award. Various photographic techniques were used to create a rich visual palette - desaturation, deepened saturation, different film stocks, skipped frames, and traditional CGI. The first beautiful shot of the film, under the credits, was of Catherine inside a comatose kid's mind - she was riding on a dark black horse across a burnt-orange African Sahara desert. She was wearing a white dress (with feathered bodice), accentuated by the brilliant blue sky. Another such image was of a surrealistically beautiful segmented horse - after being suddenly sliced into still pulsating pieces by falling panes of glass. It recalled the painting of English artist Damien Hirst. This Aardman Animations Studios' stop-motion comedy was the British studios' first feature-length film. The Oscar-winning studio had originally found success with three short films starring Wallace & Gromit: A Grand Day Out (1989), The Wrong Trousers (1993), and A Close Shave (1995). Chicken Run soon became the highest-grossing stop-motion animation film of all time at $106.8 million. The animation division of the US' Dreamworks Pictures financed the project. The main story was about a group of UK chickens (led by one of the wide-mouthed hens named Ginger) and one US rooster (Rocky) to free themselves, through a series of inventive escapades, from the farm of an evil chicken pie-making couple, Mr. and Mrs. Tweedy. The film also used some CGI effects (e.g., the explosion of the pie-making machine). Director Ridley Scott's epic sword and sandal historical drama won a number of Academy Awards, including Best Picture - and Best Visual Effects. Its latter Oscar was a win over its two competitors, Hollow Man (2000) and The Perfect Storm (2000). The major blockbuster was the story of betrayed Roman general Maximus Decimus Meridius (Best Actor-winning Russell Crowe) who sought revenge for the murder of his family, by becoming a gladiator in the Roman Colosseum. There were a total of 90 FX shots in the film. One of the most impressive sequences was the 28-second, 540-degree shot as the gladiatorial competitors stood on the arena floor in a local competition. The camera circled around them as they gazed up at the stands (rendered), revealing seats, arches, and thousands of spectators (computer-composited). Another major effort was to build a replica of about one-third of Rome's ancient Colosseum (it was only one story and not completely encircling), while the rest was filled in with CGI enhancements (of the structure and of the crowd). Part of the cost of the film went into creating a digital body double for actor Oliver Reed (as Proximo), who died before the film was completed. For his remaining scenes, a 3D CGI mask rendering of Reed's face was taken from earlier scenes (or screen tests) - for facial reference. Then, that mask was overlaid onto the face of the body double. Audio from outtakes and rehearsals were also used. Both CGI rendering and sound mixing techniques were incorporated to create the effect. Paul Verhoeven's exploitative sci-fi action thriller and part horror film was the director's last big studio film. It featured extensive and amazing special effects shots (over 560 of them), including the first anatomically-correct, totally working, 3-D computer model of a human body. In this case, it was the body of brilliant but murderous and insane scientist Dr. Sebastian Caine (actor Kevin Bacon), who tested an invisibility serum on himself and became permanently transparent and maniacal. The transformation scene in which he turned invisible was a remarkable sequence. During filming, Bacon wore full-length skin-tight costumes (in solid colors such as green - for blood, black - for water, or blue - for smoke) to aid in the addition of special effects with 'green-screen' effects. In some instances, the outline of 'invisible' Sebastian was visible when he was covered by blood, water or smoke, and it was possible to see the imprint of his feet and hands. Joel and Ethan Coen's adventure film was set during the Depression Era, in late 1930s Mississippi. Its story was inspired by Homer's epic poem, The Odyssey. Examples included the trio of seductive creek-bathing sirens and a one-eyed Cyclops known as 'Big Dan' Teague (John Goodman) with an eye patch. There were also many similarities to director/writer Preston Sturges' dark comedy Sullivan's Travels (1941). This was the first feature-length live-action Hollywood film to be entirely color-corrected by digital means ("digital intermediate (DI) technology"), giving the film a washed-out, sepia-tinted or golden tone, to invoke the feeling of old, faded, hand-tinted, or antique photographs. In particular, green colors were selectively eliminated or desaturated. Oscar-nominated cinematographer Roger Deakins' stunning digital intermediate (DI) work on the film was utilized (a process that took 11 weeks), allegedly because the Mississippi location where they were filming was "greener than Ireland," and the filmmakers wanted a different look. Otherwise, the film had very few other visual effects. This historical adventure/disaster film from director Wolfgang Petersen was based on the account of the sinking of the Andrea Gail, a commercial sword-fishing vessel, during a 'perfect storm' of hurricane winds and rain that hit the New England Coast (near Massachusetts) in 1991. 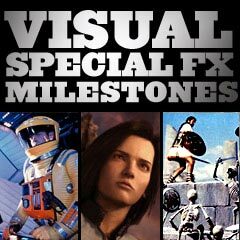 There was a total of 340 visual effects shots. Ninety of the shots in the film were entirely computer-generated or pure CGI (including virtual actors, boats, and the water), and another 220 combined both CG water or other live-action elements. Most of the live action was filmed in a water tank in front of a blue screen. Water and other effects were integrated into 250 shots that contained live actors or ships shot against a blue screen. ILM (Industrial Light and Magic) was able to integrate artificial, CG water with real water. Amazing multiple particle systems were specifically developed for the film to achieve the effect. The monster wave scene used computer-generated imaging (CGI) to approximate the look of a stormy sea with 40 foot waves, and other gigantic rogue waves. In one incredible aerial shot, the camera plunged into the spiraling clouds of Hurricane Grace and into the Atlantic Ocean below.